Ornithorynchus anatinus and Crocodylus porosus have one thing in common. 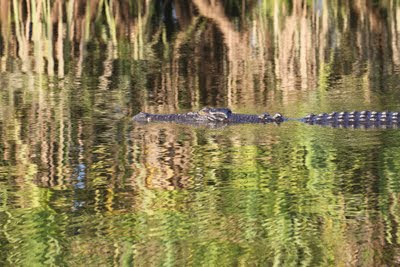 Both the platypus and the estuarine crocodile can be mistaken for logs, albeit of different sizes, when seen floating on the surface of water. But that is very much where the similarities end. Before I see my first crocodile, it has lurked in my mind much as sharks do when I take to the surf. I am swimming in Darwin Harbour in an area that looks far too manicured for crocs. I'm pretty certain it is also netted. Nonetheless, as my legs scissor and my arms thrash about, fleeting fears bubble up, literally from below. I imagine a staggered, snaggled set of teeth steeling up from beneath and ending my life in a particularly messy fashion. 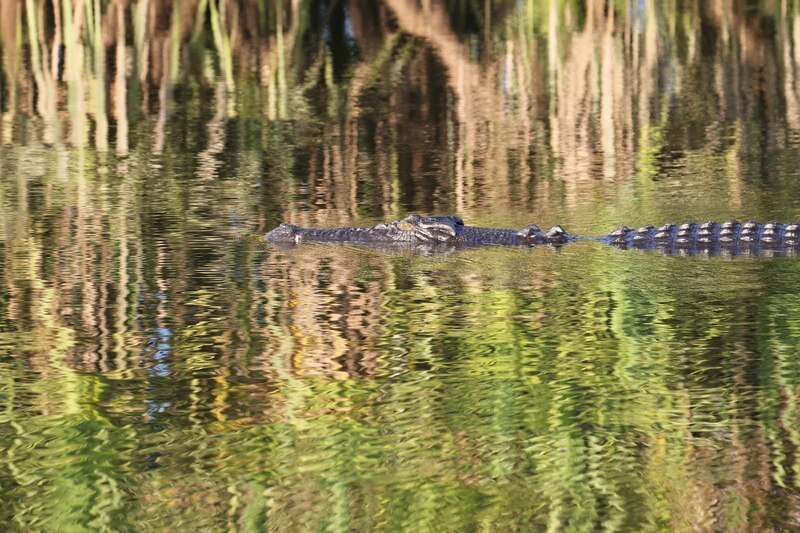 In a Kakadu billabong, in the relative safety of a flat-bottomed boat, I wonder if I’ve found my chance to dampen those fears with a dose of reality. As we edge closer to a long dark shape atop the lily-spattered billabong, it flexes its tail and heaves to alongside us. From the top of the crocodile's roughly chiselled head, a prominent, marbled-brown eye regards us, unblinking. We drift slightly apart before another micro-waft of the tail brings it back towards us, both eyes now facing our way. Looking into those vertically-slit spheres, I can understand those who see something inherently fearsome in such 5 metre long predators. The local NT News, for instance, demonises crocs ad nauseum. As I regard this crocodile’s angular excellence, its shapely, patient snout, its slit-eyed regard, I cannot help admiring it. Through more than 200 million years of earth history this beast and its ancestors have lived in waters like these. In that time they have seen the coming and going of the dinosaurs, and have survived several ice ages, all the while honing their hunting skills to an unsettling perfection. But in that amber eye I also see something unlooked-for. There’s a fragility, a reticence, that reminds me of my dog in her most sheepish moments. It may be pure fancy – either that or plain perversity – but I find myself smiling. How could I not, when I am suddenly seeing this crocodile as a dragon flung to earth? No, to water! One close-up view has made me want to dialogue with this "devil"; to know its story. I want to ask: what sin brought about your exile? What offense caused your fiery breath to be doused; your proud wings to be clipped; your eager ears to be pinned flat; your stout legs to be truncated? What transgression reduced your diet to fish and fowl, with only the occasional careless mammal for variety? In local Aboriginal language crocodile is Ginga (rhyming with "singer"). In the creation era, he killed a man, and was subsequently restricted to the lowlands. Children are also told the story of the star-dwelling Namarrgarn Sisters, who enjoyed coming down to play near the water. They took to frightening each other by changing into crocodiles that suddenly lunged out of the water. 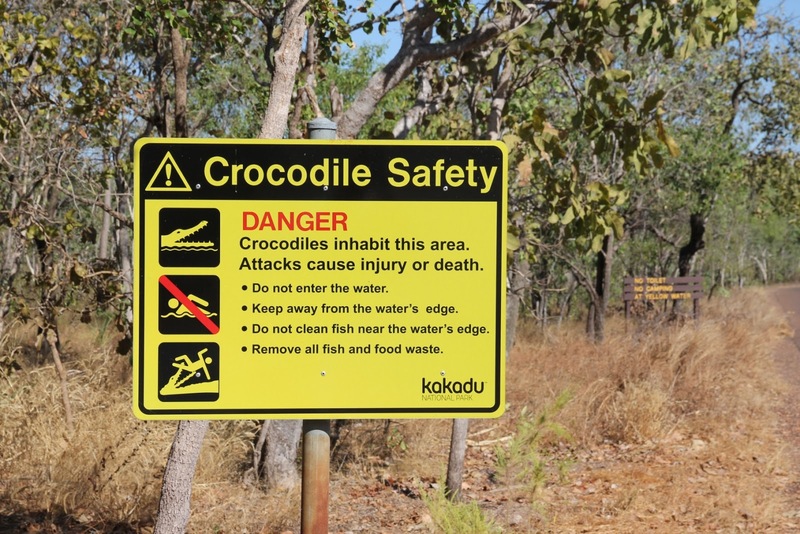 The story is meant to warn children about crocodiles and explain why they are so dangerous. 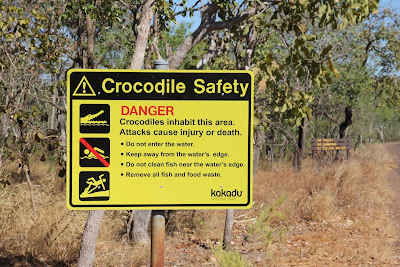 I suppose it’s fair to say that the advice is not unlike that in Lawrence and Churchill’s song, or for that matter in the signs at every Kakadu waterhole. But whether the warning be sung, recited or put on a sign, I think I'll always reserve the right to smile at the thought of Ginga as a dragon in exile. Now I know how the piano felt. 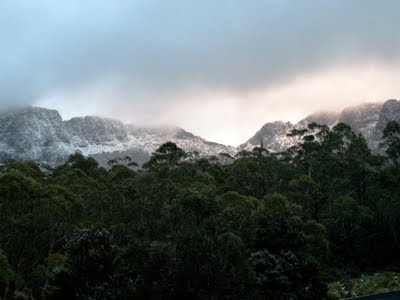 More than three decades ago we moved from central west NSW to Tasmania, taking ourselves, our dog and our piano from weeks of 40 degree dry heat to the single digit summer moistness of Fern Tree. There in Hobart's highest mountainside suburb, the piano suffered such climate shock that only a piano tuner could put it right. There is no tuner to greet us as we step out of the plane into Darwin's blue, smoke-tinged heat. Just hours before we'd been in a Hobart lashed by storm-force winds, with snow imminent. Even though it's the dry season, the drive from the airport still shouts to us that we're in the tropics. Banyan trees, frangipani, hibiscus, palms - a veritable hosanna of herbiage. I search for an appropriate term to describe my sense of dislocation. Climate shock isn't enough because it's about a lot more than climate. Nor is it quite culture shock, although there are elements of that. There is a whole suite of subtle and not-so-subtle differences: temperature, humidity, smells, sounds, light, flora, fauna, the plain look of the place. The Greek word for place is topos (hence "topography" etc). But somehow topo-shock doesn't trip off the tongue. Whatever it is, there is nothing like immersion in a new place to help cure the dis-ease. 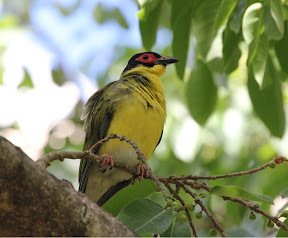 The call of a figbird, both unfamiliar and enchanting, lures me into birdwatching. Right in central Darwin, in a vast banyan tree, figbirds are calling each other with their loud, slightly descending chiew. Figbirds eat what you would expect them to eat, given their name. 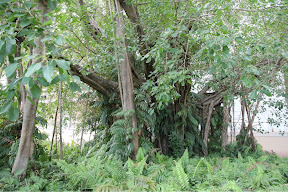 And the banyan, being in the Ficus genus, is full of figs. But the birds are not just feeding in the city, they are nesting here too. They weave large cup-shaped nests out of banyan leaves, vines and twigs. Some of these are visible from the street, as are the vibrantly-coloured male birds. We watch long enough for me to photograph both bird and nest, all the while feeling the enchantment of their bright calls in this unlikely setting. Changes in latitudes, changes in attitudes, as Jimmy Buffett sang in the 70s. I have a rule of thumb: you can tell the ambient temperature of a place by running the cold tap for thirty seconds and then drinking from it. Darwin water isn't quite body temperature, but it's not that far off it. Better perhaps for swimming in than drinking, immersing rather than imbibing. Other differences bring a wry smile. While al fresco dining is pretty much universal throughout Australia, the paraphernalia needed to make it more comfortable is a little different here. We have an outdoor lunch at an Irish pub (some things are universal) and notice that where overhead gas heaters would be in Hobart - and much of southern Australia - in Darwin there are overhead fans. On Sunday night we head for Mindil Market, an outdoor market behind the dunes of Mindil Beach. The place thrums: it seems half of Darwin is here. But around 6:20 pm the market goes quiet, the buskers lay down their instruments. In a scene reminiscent of Time Machine - minus the siren sounding - everyone suddenly walks onto the beach. 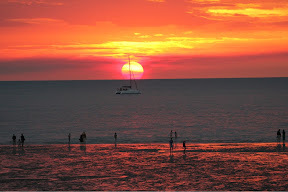 The beach faces the Arafura Sea, and the sun is lowering towards it. It's been overcast most of the afternoon, but the sun is about to break out into a wedge of clearer sky just above the western horizon. Hundreds and hundreds of people are lined up along the beach, sitting, standing, eating, chatting, testing cameras, commenting on the sky. 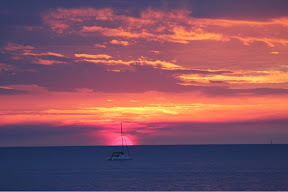 The dry is burn-off season in the Top End, and the sunset colours are richly enhanced. At about 6:35 the sun eases itself below the horizon. People spontaneously clap, some even cheer. Everyone seems to be smiling, confiding their feelings to strangers. Darwin has its party scene, its crocodile shows, even its casino. But night after night crowds like this turn up to see what is obviously the best show in town. I live a whisper short of 43 degrees latitude south, although the mild weather belies that fact. In Vladivostok or Toronto, two of Hobart’s northern hemisphere latitudinal equivalents, average winter maximums are below zero, and snow is a part of daily life. Here snow is a part of daily life perhaps once a decade. The difference is down to our proximity to the sea, which has a strong moderating influence on temperatures. The trade-off for that protection is our exposure to the Roaring Forties. That band of winds gushes around the southern parts of the globe, interrupted only by Tasmania, New Zealand’s South Island, and South America. For the past week, it has roared with singular ferocity. Our protective weather angels, those plump highs that process across the island, have fled north, leaving us at the mercy of winds hurtling up from the Antarctic south. If King and Flinders Islands were spinnakers, and the rest of Tasmania a vessel, we would long ago have fetched up on the shores of Aotearoa! And I’m not sure they’d have been surprised. In Maori mythology, Tawhirimatea is the rather fierce god of weather. After a dispute with his brothers over their role in separating his parents, Tawhirimatea vowed to bring havoc to his brothers' lives and that of their children. On occasions he is persuaded by his parents to be forgiving, and the weather is calm. At other times he remembers his vow and sends tornadoes, hurricanes, and cyclones. Two nights out of the last six, Tawhirimatea has been very grumpy indeed. On both occasions I have lain in bed waiting for the roof to lift. Whistling and wailing; thumping and rattling, groaning and grinding, the house has voiced its timorous resistance to the wild weather god. On this morning’s walk, while finding precious few fallen shingles, I did have to walk around a number of ravaged trees, including a massive bunya pine branch. It must surely have wondered why it was ever transported here from Queensland. I assume Beaufort wasn’t a bird man, or else he might have added a few notes about the wind’s effects on our avifauna. At 2:30 this morning I heard a number of clinking currawongs flying over, in complete darkness, giving voice to their disgruntlement. They were presumably in search of somewhere safer to roost. And then there was the gull I saw later in the morning. By 8am the wind had backed off to a dull roar, though I was still getting its assistance as I walked unusually swiftly to work. At one point I noticed I was matching speed with a silver gull. This might have been commendable but for the fact that it was actually flying in the opposite direction. A colony of gulls lives under the Tasman Bridge, and each morning the group flies upstream to plunder the riches of McRobeys Gully Tip. Every time this particular silver gull flapped or veered, the opposing wind would hoosh it backwards. It hunted the full width of the valley searching for a break from the headwind. The last time I saw it, it was still being blown backwards. I’d have been tempted to give up and go back to bed. Apparently there is no official collective noun for a group of writers. Among those proposed, I’m rather taken with a block of writers. Apart from its delightful play on words, it proves perfectly suited to that sub-set of writers I find myself amongst. A bush-block of nature writers sounds pretty well perfect to me. That said, I’m not sure the word will die of over-use. Writers are more lone wolves than herd animals. Most of our work is done alone and in our heads, which at times can be filled with our howls. 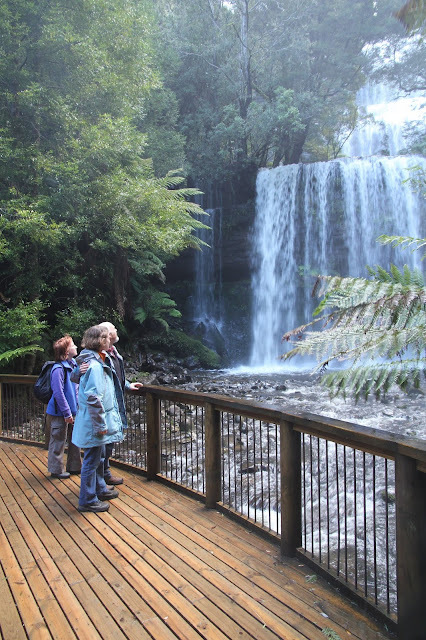 That’s all the more reason to get out and enjoy the occasional gathering of writers, such as last weekend’s workshop in Tasmania’s Mount Field National Park. 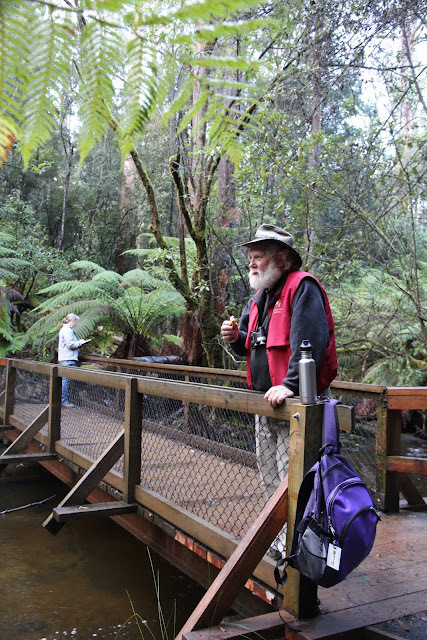 Under the guidance of visiting US writer and ecologist, Dr Robert Michael (Bob) Pyle, twenty-something Tasmanian nature writers really did go bush to work on the craft of nature writing. Dr Pyle, who is based in Washington State, is both a world-renowned butterfly expert, and a prolific, award-winning nature writer. Water, in all its forms, seemed a thematic thread for the day. Outside we heard it, felt it, smelled it, tasted it, saw its effects in the forest all around. Inside we reflected – itself a water-inspired metaphor – on what we were experiencing. Using “river of words” exchanges, Bob Pyle got us writing and sharing, initially through brief exercises, later through more complex challenges. He reminded us that while a reporter reflects, a poet refracts. 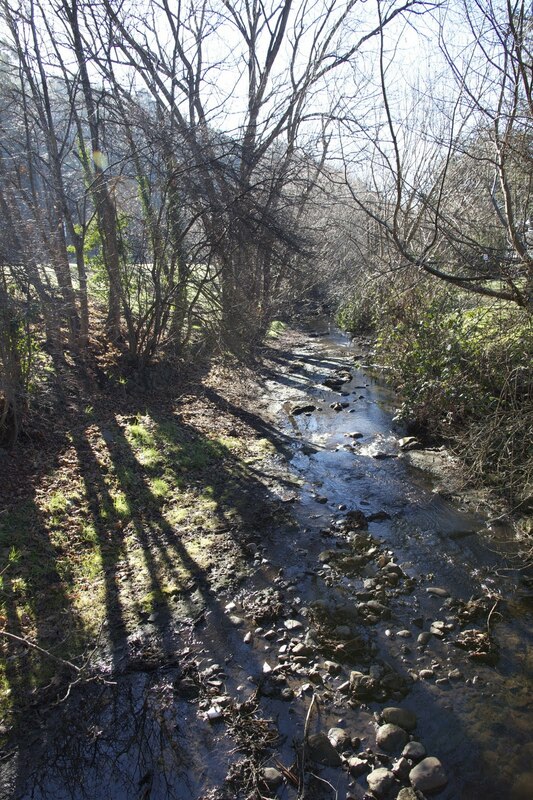 As a trained ecologist Pyle is used to accurate and factual reportage. Many of his works are scientific guides. And he quotes fellow lepidopterist – and famous novelist – Vladimir Nabokov, on our obligation to “attend to the individuating details”. But that attention to particularity, for the nature writer, leads on to a strong identification with place: what Pyle calls a “rooted companionship with homeground” (borrowing from Oregon poet Kim Stafford). In turn that leads to a sense of obligation to connect with the audience about that experience of place, something which can only be refracted through the individual personality of the writer. I would risk summing it up like this: Give me the facts by all means, but also let me hear just a little of that howl in your head. It’s not something everyone can pull off, but you know it’s worked when you read it, or hear it read. I wish I’d written down Bob Pyle’s words inspired by his first sighting of a platypus. It happened during the workshop, while we were walking beside Russell Falls Creek. From memory he rejoiced in the platypus’s oneness with the flow, as it disappeared downstream after his “nano-sighting”. Perhaps this longer quote from “Wintergreen”, a book of his essays (published by Sasquatch Books), will reveal more of his style. As something of an arachnophobe, he writes this about spiders. Spiders, as one learns, enhance one’s life even if one is not an arachnologist. Of course they consume flies and other bothersome insects in large numbers; but consider their beauties too – such as the crosslike pattern on the backs of the big female orb weavers so common hereabouts. Need so much as a word be written about the beauty of webs in the morning, in a misty place so generously hung about with them? Their short-lived lambency so perfectly reflects the nature of light and substance in a land where the distance from dead gray to brilliant silver is an angstrom or less, where form and formlessness mingle intermittently in the mist. I grow more and more appreciative of spiders’ ability to disperse when I watch the rain of gossamer in summer; exodus of spiderlings ballooning wherever the breeze should take them.